Galaxy F Renders: Will Samsung's Foldable Phone Look This Cool? Galaxy F Renders: Will Samsung’s Foldable Phone Look This Cool? Samsung has been teasing its foldable smartphone dubbed Galaxy F for months. According to recent reports, the Korean company is planning to unveil (again, but this time in full) the device at its Unpacked event in San Francisco on February 20. We have seen a few Galaxy F renders in the past but they appear to be far away from the phone’s final design. A few days ago, Samsung Vietnam released a video teasing a number of yet-to-launch Samsung devices. Though the teaser video was pulled out quickly, it showed a woman holding the foldable phone. It was the clearest view of the device Samsung has offered us so far. Back in November, the company had teased the foldable phone at its developer conference, but it was wrapped in a bulky case to hide the design details. While Samsung Vietnam had removed the teaser video, the Korean company later released it officially along with a blog post about its futuristic 5G and foldable phones. 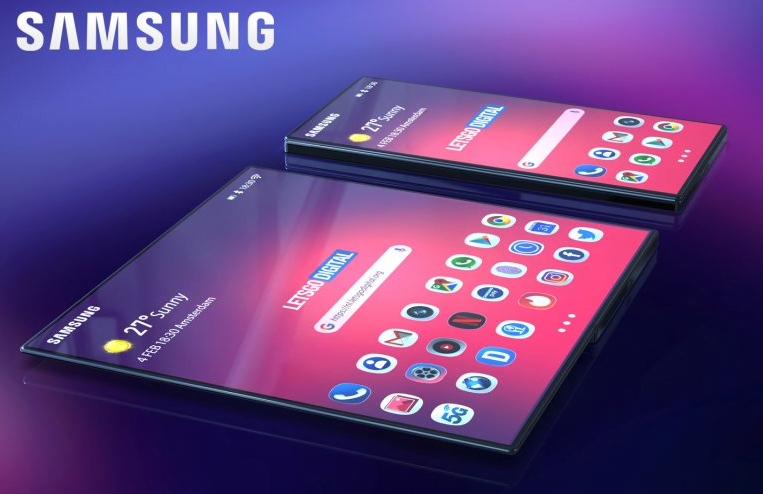 Based on the foldable phone in Samsung’s video, folks at Dutch publication LetsGoDigital have created Galaxy F renders that look incredibly cool. We wonder if Samsung’s actual phone would ever look this gorgeous. It’s no secret that the Galaxy F would use Samsung’s Infinity Flex screen. It would have an external display to let users interact with the device without having to unfold it. You can unfold it like a book to access the larger display. The Galaxy F renders created by LetsGoDigital show a device that folds flat. It doesn’t have a Microsoft Surface Book-like segmented hinge. The device looks pretty thin and light, which can be partially attributed to the new polarizer filter. Samsung said at its developer conference in November that the new polarizer filter is 45% slimmer than its predecessor. When folded, it looks like a regular smartphone with four icons in a row. Also, the phone has almost no bezels – neither on the external display nor on the internal screen that folds in half. Samsung told developers in November that the foldable phone would sport a 4.58-inch display with 840×1960 resolution on the outside and a larger 7.3-inch screen with 1,536 x 2,152 resolution on the inside. Samsung worked with Google on UI to ensure that apps can transition from the external display to the internal one seamlessly. The Galaxy F is expected to run Samsung’s One UI on top of Android 9 Pie. The device is said to have two batteries, which is necessary to power two screens through the day. One interesting thing about the Galaxy F renders is that the selfie camera isn’t visible on either side of the handset. There is no room for the camera above the external or internal display. Samsung could place it under the display. It’s also possible that the rear camera would somehow serve as the selfie camera as well. The rumor mill claims it would have a triple camera setup on the back. According to recent reports, Samsung’s foldable phone with model number SM-F900 has received certification in China. It indicates that the official unveiling is imminent. 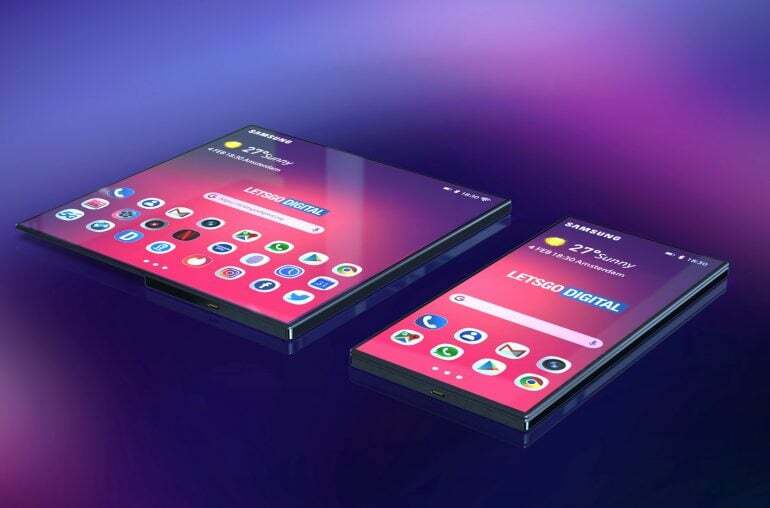 Other reports have claimed that the foldable phone would offer dual-SIM functionality and 512GB of internal storage. The Infinity Flex display will be expensive to produce. That coupled with the new design would make it far more expensive than regular smartphones. Most mainstream customers won’t be able to afford it. That’s why Samsung will reportedly target gamers with the foldable phone. According to Golden Bridge Investment analyst Kim Jang-yeol, it would cost two million won (about $1,800) in South Korea. Another report from Gizmodo UK claims it would cost GBP 1500 for the base model and about GBP 2,000 for the highest storage variant. Samsung hasn’t officially confirmed the pricing yet. At the Unpacked event on February 20, Samsung is also rumored to show off three models of Galaxy S10 and its first 5G smartphone. It’s unclear when the foldable phone would go on sale. The Galaxy S10 would be up for pre-order on February 21 and would hit the store shelves on March 8th.